Patients are warned not to drink apple cider vinegar without first diluting it in water. As a vinegar, ACV is extremely acidic and may contribute to the erosion of tooth enamel if it is not watered down first. 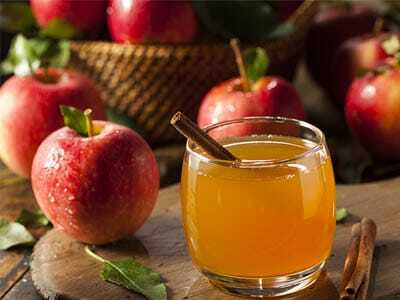 ACV may also irritate and burn the esophagus if consumed directly from the bottle. There are many individuals praising apple cider vinegar for a wide array of holistic health benefits. The most noteworthy benefits include blood sugar control and GI tract optimization. The health benefits of apple cider vinegar may also include optimization of the GI tract. Choose an organic and unpasteurized bottle to take advantage of raw enzymes and natural probiotics, both of which help the GI tract to break down and absorb food without suffering irritation. Your teeth can benefit from this as well, as new research indicates that probiotics may help to prevent cavities. First thing in the morning. Mix 1-3 teaspoons of apple cider vinegar with 16-20 fluid ounces of purified water. Drink this as soon as you wake up, on an empty stomach. Throughout the afternoon. Carry an iced mixture of diluted apple cider vinegar, mixed in the proportion described above. With any meal. Apple cider vinegar goes great on salad, sautéed vegetables, and many other leafy greens. For more delicious way to add this healthy vinegar to even more meals, check out this apple cider vinegar dressing recipe. At Assure A Smile, every member of our team is focused on helping you make positive lifestyle choices that will create healthy teeth and gums for life. From optimizing nutrition to helping patients choose safe and bio-compatible dental materials, each member of our team has the knowledge and experience to help patients build lifelong oral health and total body wellness. Schedule an appointment with Assure A Smile online, or speak with a friendly member of our front desk at 305-274-0047.